The Moonsea proper is a deep natural lake located north of the Dalelands and west of the Vast, connected to Sea of Fallen Stars by the shallow, swampy River Lis. 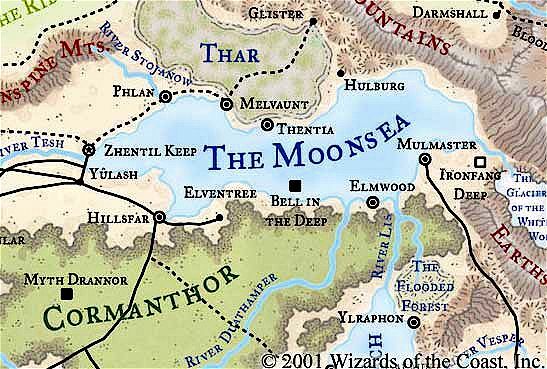 The name "Moonsea" applies to both the lake and its environs, which stretch south as far as the mouth of the Lis where the river flows into the Dragon Reach, west to the Dragonspine Mountains, north to the frigid steppes of the Ride, Thar, and the Tortured Land, and east to the Galena and Earthspur Mountains. The Moonsea region holds a huge amount of mineral wealth for those hardy enough to brave peril to win it. The area is infamous for its bleak landscapes, harsh winters, ravaging dragons, pirates, and rapacious local governments: Some of the most aggressive cities in Faerûn rise from the Moonsea's shores: Hillsfar, Mulmaster, and Zhentil Keep. Wherever a government exists in the Moonsea; it rules with an iron grip. Tombs, ruins, and monster lairs abound in the Moonsea, as do complex intrigues and double dealing tyrants. The battle cry of the area is well chosen: "Dare - and Beware!" The Moonsea is a frontier, with a frontier mentality. The area stands as a buffer between the elven lands to the south and the darker, more sinister lands of the Ride and Thar, home of dragons, giants, and ogres. Cities rise quickly, built on nerve and wealth, only to fall in wars or raids and then to be rebuilt once more. Only the strongest and most savage prosper in the lands of the Moonsea. Evil folk who ruthlessly control their lands rule the greatest cities. The people of Hillsfar, Melvaunt, Mulmaster, and Zhentil Keep are accustomed to cruel lords, for this is a cruel land. Better to support the devil one knows than confront one of even more deadly and fell power. The lesser cities of Elventree, Phlan, and Thentia are less overtly evil but have a strong, independent, almost chaotic nature. The people of the Moonsea view the rest of world and even the other Moonsea cities with suspicion and distrust In return, the rest of Faerûn sees the people of the Moonsea as unfriendly, sullen, dispirited, crafty, and most of all dangerous. In truth; they are no more universally evil than the well-respected Dalesfolk to the south are universally good. But travelers here are best forewarned to remain wary nonetheless. The Moonsea itself is the dominant feature in the Moonsea area, along with the fast, cold rivers that feed and drain it and the mountains that border it. North and west of the Moonsea, the intrigues of the cities fall away to the brutal dangers of the environment and native inhabitants who don't care for having their lands invaded. Dragonspine Mountains: The western end of this high mountain range marks the western extent of the Moonsea area. Red and white dragons lair among the higher peaks. Goblins, orcs, and giants occupy the lower peaks and the valleys. Mines in the western half supply minerals to Zhentil Keep, while the cities of Melvaunt and Hillsfar draw resources from the eastern half. The Flooded Forest: This fetid swamp surrounded by boggy wood land lies between the river Lis and the Earthspur Mountains. Once an arm of Cormanthor, the area has sunk into a low bowl over the course of the past hundred years or so. The trees of the forest still stand, but have been dead for more than a century. Many are ready to fall at the slightest touch. Explorers face as much danger from falling trees as from wandering monsters. Hanging mosses and mushrooms are everywhere. Denizens of the swamp include lizardfolk, black dragons, a number of fungus creatures, and carnivorous plants. Some of these creatures are not native to the area, giving rise to claims that someone or something is stocking the swamp to keep others away. The depths of the swamp hold the hidden lairs of brigands and pirates (especially near the southern end} Rumor has it that the swamp also hides ruined temples of Gruumsh, Moander, and Bane. With the return of Bane, it's a good bet that any temple to that deity hidden in the swamp has been secretly repaired and reopened, perhaps with an eye toward extending Bane's influence south into the Vast. The Moonsea: The depths of the Moonsea's cold, clear, and purplish waters are said to have connections to underground seas and to the Elemental Plane of Water. No permanent islands break its surface, but rumors persist of isles that rise from the deeps on certain nights of the year. The sites of the Moonsea include its cities and the ruins that reflect its long and violent past. Many roads, trails, and unmarked caravan routes lead into the Moonsea region, particularly from the north. Most traffic within the region goes by ship, however, since roads and good trails between the area's city-states are almost nonexistent The area is sparsely settled, with clumps of civilization huddled together against the cold and marauders from the north. For travelers on foot, it can be a long way between waystops and supply sources, and there is no-such thing as a safe campsite. The Bell In the Deep: One of most mysterious sites in the Moonsea area, the Bell in the Deep is part of the ruins of Northkeep. The upper reaches of Northkeep - its slender, now broken spires - remain visible to passing boats. The area is said to be haunted, as the original defenders of Northkeep watch over the Cold Lands. On fog-ridden nights, the bells of the tallest towers, now submerged, can be heard as far away as Hillsfar. Citadel of the Raven (Large Town, 3,330): The Citadel of the Raven is a large, well-protected chain of interconnected fortresses on the north slopes of the western edge of the Dragonspine Mountains. The fortress chain stretches for some ten miles and can house a large number of troops. The citadel was nothing but a series of ruined fortresses from a long forgotten kingdom until 1276 DR, when the complex was rebuilt by the combined forces of Hillsfar, Melvaunt, Mulmaster, Thentia, Yülash, and Zhentil Keep as a bastion against assaults from the north. Garrisoned by the combined forces of these cities, the fortress repulsed constant ogre and orc attacks. In 1355 DR, through a combination of bribery, threats, and treachery, Zhentil Keep gained control of the citadel, expelled all other forces, and raised the banner of the Zhentarim over the site. During the siege of Zhentil Keep, the Zhentarim moved their headquarters to the citadel, and it remains their base today. The citadel boasts a garrison of twenty-five hundred troops, plus an additional two hundred clerks, scribes, servants, and minor functionaries required to manage the Zhentarim's far-flung interests. A small town consisting of refugees from Zhentil Keep and Zhentarim hangers-on has sprung up near the citadel in recent years. Its population currently numbers about six hundred and is still growing. The Zhentarim once discouraged people from settling near the citadel, but now they see the need for the services a full-fledged community can provide. The Zhentarim have laid plans to fortify the town and now welcome professionals, skilled craftsfolk, and farmers to the settlement. Fzoul Chembryl is the titular commander of the citadel, though he spends most of his time in Zhentil Keep now. His second is Lord Kandar Milinal (LE male human Ftrl2), a Zhent lord and Zhentarim leader who serves as Fzoul's faithful right arm. The archmage Manshoon, who ruled the Citadel for years in the name of the Zhentarim, still maintains a fortified keep here guarded by many deadly spells and creatures. The founder of the Zhentarim comes and goes as he pleases, advancing the Black Network's cause in whatever manner he sees fit, even if he no longer commands its forces directly. Elventree (Hamlet, 366): Located at the edge of Cormanthor, Elventree served as a meeting place between elves and humans in the centuries following the fall of Myth Drannor. Long a haven for rangers, artists, half-elves, and druids, it is also a Harper outpost. Elventree is laid out like an elven village, with homes in shallow caverns and hollowed-out trees. It has no large buildings or cleared commons. Elventree is leaderless but not lawless, because of the presence of the Harpers, the elves, and the worship of nature deities such as Silvanus, Eldath, and Mielikki. It is defended in its time of need by its inhabitants, include several powerful mages as well as the clergy of temples to Mielikki and Mystra. The city is now governed by Maalthiir, First Lord of Hillsfar, a shrewd, ruthless, and independent merchant-mage (N male human Wiz18) The Red Plumes, a former mercenary company now grown to more than five thousand strong, support Maalthiir's rule. Hillsfar has become infamous for its arena, a site of gladiatorial games. Non-humans are very likely to wind up there, along with anyone who proves unpopular with the established regime that day. Hillsfar is also notable as the second city in the Moonsea to grant an enclave to the Red Wizards of Thay. Ironfang Keep: This forbidding keep fashioned from black basalt stands atop the cliffs near the mouth of the White River. The keep has only a single entrance (a doorway at ground level) and no windows or battlements. Ironfang has long been reputed to be the home of a school or community of wizards of great and dark power. A petty king or minor baron sends a party of adventurers to Ironfang every decade or so, only to discover soon afterward the remains of the group stacked like cordwood in his bedroom. An army once sent out of Mulmaster only succeeded in stirring up the local gnoll population. The keep seems impervious to all divinations and teleportation effects, even those cast inside its walls. It is unclear whether this effect resides in the area surrounding the keep or if it is due to some property of the keep's walls. No credible accounts of the keep's interior exist, but accounts from occasional survivors of encounters with the keep's wizards indicate that they seem most active at night, and their magic is exceedingly difficult to detect or dispel. Some speculate that the keep houses a school for Shadow Weave users, a cabal of shadow adepts, or both. Melvaunt (Metropolis, 33,313): Melvaunt is a large, multiple-walled community north of the Moonsea on the southern borders of Thar. Melvaunt is a cold, austere place, smoky from its continually worked forges and smelters. Its populace tends to be both ruthless and unfriendly. Melvaunt is a merchant's town and a smith's heaven. The sky is dark from forging, the air heavy with the flurry of construction, and the atmosphere foul from smoke. Trade rules all activity in Melvaunt, mostly conducted in the open market in the center of the city. All commodities are available somewhere for some price, and Melvauntians engage in the slave trade, shipping suitable captives south to the Old Empires and the Pirate Isles. Melvaunt and Hillsfar have traditionally marked the eastern extent of Zhentil Keep's influence on the Moonsea region, and for all practical purposes they still do, despite Mulmaster's alliance with the Zhentarim. Melvaunt is a city of intrigue, primarily between the three major noble families: the Leiyraghons, the Nanthers, and the Bruils. These three families are unified only in their hatred of the Black Network. Each seeks to control the ruling Council of Lords and dominate the city's trade and manufacturing. Small battles in the streets between bravos of various factions are common. The army of Melvaunt numbers five thousand swords and it is often supplemented by hired mercenaries. The general of the armies is the Lord of Keys, a phenomenally strong and cruel man named Halmuth Bruil (NE male human Ftr13). Melvauntian forces wear cloaks and armbands of purple, with the badge of a silver sword transfixing a silver anchor. Mulmaster (Metropolis, 46,639): Mulmaster is built upon the slopes of mountains that peak to its south. The Moonsea protects its north side, and a large keep guards the road leading south into the Vast. The whole of Mulmaster is a naturally protected fort and one of the strongest such areas on the Moonsea, rivaling Zhentil Keep at its zenith. The highest spur of land in mountainous Mulmaster is the site of the Towers of the Blade. Here the ruling families of the city abide, led by the High Blade of Mulmaster, Selfaril Uoumdolphin (NE male human Ftr20/Rgr2). Selfaril is a wily, cagey man who spent years trying to block Zhentil Keep's influence over the eastern Moonsea. He sought, by alliance and military force, to become the dominant power in the region. His sudden move to join the Zhentarim took people by surprise, though many simply assumed he had chosen to throw in with the likely winner. In truth, Selfaril was replaced by his twin brother Rassendyll, who stole his sibling's name and place. "Selfaril" is a scheming, conniving, and dangerous ruler who secures his command by killing or discrediting any who threaten it. Recently, the High Blade wed the First Princess of Thay, the tharchion of the Tharch of Eltabbar. She retains her residence and court in her homeland but visits her spouse three times a year, traveling via magical means to his side. The princess is a woman of considerable beauty and great ability, and the activities of the Red Wizards have dramatically increased in Mulmaster during the 16 years of their courtship. A Red Wizard enclave has stood in the city's trade district for years. Mulmaster has a fighting force of six thousand blades and fifteen ships, though these are old cogs and coasters. More deadly are the Cloaks of Mulmaster, a collection of wizards sworn to defend the throne of Mulmaster (if not always its occupant) in much the same way as the War Wizards do in Cormyr. Any mage of 4th level or higher is "persuaded" to join the Cloaks or leave town. There are over two hundred Cloaks, with twenty-nine of them of 12th level or higher. The Senior Cloak is Thurndan Tallwand (CE male human Wiz19} All non-Cloak mages are forbidden to practice magic within Mulmaster on pain of torture, maiming, or death. This limitation does not apply to diplomatic missions and royal courts. Nor does it apply to individuals serving in the Red Wizard enclave. As part of his bargain with Fzoul Chembryl, the High Blade allowed the construction of the House of the Black Lord. This temple of Bane (begun as a church to Xvim and reconsecrated) was completed early this year, a development that the rest of the Moonsea sees (correctly) as extremely ominous. Phlan (Large Town, 3,198): A city ruined but never fully destroyed by war, invasion, and dragon's strike, Phlan is beginning to regain a semblance of its once-great glory. Situated at the mouth of the Stojanow River, the town has become a popular stopover point for ships and caravans across the north, particularly now that access to Hillsfar is limited. Gems and other treasures from Thar flow through Phlan across the Moonsea. With trade comes adventurers, settlers, farmers, and most of all, gold. A rotating Council of Ten (all judges) rules Phlan. The head of the council is the High Councilor, who acts as mayor. A stern ex-adventurer named Kella Voskorm (LN female half-orc Ftr7) currently holds the post. Elections are common, because votes of no confidence are called for with every setback or charismatic new hero who appears. Much of Phlan is still ruined and lies in wreckage, and rebuilding is a major preoccupation. Arrested felons are assigned to reconstruction tasks. Each day finds new discoveries and perils in the heart of the ruins. Teshwave (Small Town, 1,256): Once the most productive city of old Teshendale, Teshwave is used by Zhentil Keep as a military base and launching point for caravans and military expeditions into the Dales. During the siege of Zhentil Keep and its aftermath, Teshwave was an important marshalling point for troops and supplies bound for the Moonsea. Teshwave has a military government controlled by the commander of the strongest unit present. Usually this is a warrior of 8th to 12th level backed up by several mercenary units, a few priests of Bane, a wizard of 6th level or so, and several tribes of orcs, gnolls, or ogres. In addition to its permanent population, Teshwave usually holds two thousand to three thousand troops at any given time. Thentia (Metropolis, 26,671): A fiercely independent but militarily weak city on the Moonsea's northern coast, Thentia is the most open city on the Moonsea. Thentia is overseen by a watchlord elected by the local nobility. The current watchlord, Gelduth Blackturret (LN male human Ari1/Ftr10), rules with the lightest of hands, since his power is little more than symbolic. The true power is in the hands of the local nobles, old families with names such as Swifthands, Khodoils, Mamarrathen, Birneir, and Casplardann. These nobles are in turn supported by independent (and generally chaotic) mages. Thentia has the largest collection of powerful, disorganized wizards in the Moonsea area (except perhaps for the mysterious conclave in Ironfang Keep). They live in relative peace, since many of them came here to escape from the Cloaks of Mulmaster or the War Wizards of Cormyr. These worthies include Phourkyn One-Eye (NG male human Wiz20/Acm3), Flammuldinath "Firefingers" Thuldoum (CG male human Wiz20), Rilitar Shadow-water (CG male moon elf Wiz17), and the mysterious mage known only as Scattercloak (CN? male? human? Wiz?). These individuals make Melvauntian slavers, Zhentil Keep raiders, and Moonsea pirates think twice before attacking Thentian ships and citizens. Voonlar (Small Town, 1,778): Voonlar is Shadowdale's chief rival. The Northride, the trail leading to Shadowdale and Teshwave, and Shind Road, which goes to Teshwave, meet in Voonlar with the town's important buildings at the crossroads. Voonlar is nominally independent, ruled by an elected bron (sheriff), who may direct up to six full-time deputies plus a militia of villagers raised as needed. In theory, all villagers vote in the annual election of the bron. In reality, the Zhentarim control the town, and its bron is a long standing puppet. The present bron, Buorstag Rlammythyl (LE male human Ftr9), is a burly fighter who worships Bane. He gained formidable reputation as a mercenary before his arrival in Voonlar. Voonlar is a relatively peaceful town. Its people are used to the foul nature of their lord and willing to pay taxes to support mercenary activity in the Dalelands instead of serving themselves. The village is the headquarters of the Shield Trading Company, a minor merchant trading house that serves both the Moonsea and the Dale regions. Fairly reputable, the trading company is (correctly) considered to be independent of Zhentarim influence. Ylraphon (Small Town, 1,666): This small port on the Sea Fallen Stars (pronounced "Ee-yilra-fon") is sometimes considered part of the Vast. Originally built by elves, it has been overrun by successive waves of orcs, dwarves, and humans. The outskirts of the city lie in ruins, and the Flooded Forest is encroaching on the town's eastern edges. All manner of vagabonds, pirates, and brigands find Ylraphon a haven. A council of independent merchants, some whom may be smugglers or pirates, governs Ylraphon. Yülash (Small Town 1,134): Yülash was once a large fortified city, but half the buildings have been reduced to scattered piles stone by the continual warfare that has plagued this area. The city became a bone of contention between the forces of Hillsfar and Zhentil Keep. In the conflict much of the city was ruined. What remains of Yülash clusters behind hastily constructed stockades. The largest of these stockades is set up around the ruins of the main citadel, which flies the banner of Zhentil Keep. The Zhents claim Yülash as a "protectorate." Yülash's importance rests in its location. It is seated on a wide plateau of stone and earth that rises above the surrounding area like a shield laid battle-side up, and it commands the region for miles around. Yülash's plateau is reputed to be tunneled with secret passages and hidden lairs, and the caverns beneath the surface have extra-dimensional portals to other planes of existence. For this reason, the ruins still attract adventurers. Zhentil Keep (Large City, 14,658): The first human city built on the Moonsea north coast, Zhentil Keep has always been rich thanks to the mines of the northern Moonsea, whose ores and gems flow through it. Perched at the western end of the Moonsea, Zhentil Keep was once a walled metropolis with a population of nearly fifty-seven thousand. It was (and remains) one of the major ports of the Moonsea. At its height, Zhentil Keep was a mass of stone buildings six stories high and spanning both banks of the River Tesh. The north section was sacked and destroyed in 1368 DR, along with both of the city's bridges. The survivors crammed themselves into the southern section, which had its own fortifications. The Zhents have since rebuilt both bridges and repaired the harbor facilities on the north bank of the Tesh. The harbor has been walled off from the surrounding ruins, and the Zhents are busy repairing the entire wall surrounding the northern section as a prelude to restoring the rest of the city. In many other ways, Zhentil Keep is as it always has been. Press gangs still roam the streets at night, seeking unwary civilians to force into the ranks of the Zhent military (or sell into slavery at a tidy profit. Visitors can expect to be stopped and questioned about their business at any time. Evil deities, particularly Bane, are venerated in Zhentil Keep. Followers of Cyric, however, are not welcome. After the return of Bane, every follower of Cyric in the city was given one chance to convert to Bane. Those who refused or even hesitated were sacrificed to Bane. Many clerics and followers of Cyric escaped the carnage and fled to Amn. The worship of good deities is not outlawed in Zhentil Keep, but it is discouraged. Now more than ever, Zhentil Keep is under the iron hand of the Zhentarim. The Black Network survived the destruction of its home city with little damage, because the organization's leaders, agents, treasures, and secrets were hidden in the Citadel of the Raven and at Darkhold in the Western Heartlands. With the fall of the Keep's city lords, the Zhentarim now openly rule here. Fzoul Chembryl, leader of the Zhentarim and high priest of the temple of Bane, declared himself tyrant upon the death of Lord Orgauth, the last city lord. As far as Fzoul is concerned, Zhentil Keep is only one of the Zhentarim's bases and holdings, and he administers the city as an armory and haven for the Black Network. Zhentil Keep currently has a garrison of about two thousand troops and serves as the main base of the Zhent navy (currently nine ships, with more being built} The current castellan and champion of the Keep, Scyllua Darkhope, commands the Keep's army and the city watch. She also oversees Zhentarim interests in the Keep itself and the nearby conquests of Teshwave, Voonlar, and Yülash, freeing Lord Fzoul to turn his attention to greater designs elsewhere. The first human settlement in the Moonsea region was Northkeep, a city founded in 348 DR on an island near the lake's southern shore, about midway between the present towns of Elventree and Elmwood. Northkeep was a beacon of civilization and a jumping-off point for merchants seeking trade with the dwarves of the North - including not only Tethyamar, but the clans of the Cold Lands - who traded their metalwork and craft for much-needed magic. The power of Northkeep made it a target for orcs, giants, and other evil beings, who formed the Dark Alliance to battle and contain Northkeep. The Dark Alliance seemed disinclined toward sea actions, and Northkeep appeared safe on its island. In 400 DR, however, a huge force mounted on dragonback swept over the city while ships landed an army that overran and sacked the city. To make their victory complete, a force of nonhuman mages and clerics (forty thousand strong, some chronicles say) gathered on the north shore of the Moonsea and brought the vengeance of their deities down upon the human interlopers. The city sank beneath the purple waves. Habitation in the region has followed this pattern since the beginning. Human settlements thrive for a few years, usually through sheer willpower and on the strength of sharp swords, and then fall to goblins,, orcs, dragons, beholders, or giants. Zhentil Keep dominates the recent history of the Moonsea. On the surface Zhentil Keep has always been just one of several petty states vying for control of the region, the other contenders being Hillsfar, Melvaunt, and Mulmaster. Zhentil Keep, however, is at the seat of the infamous Zhentarim, a cabal of evil priests, wizard and inhuman creatures bent on controlling all the trade and power between the Sword Coast and the Moonsea, including the intervening lands of Cormyr and Anauroch. After the fall of Bane during the Time of Troubles, the deity Cyric briefly held sway over Zhentil Keep. Cyric's priests launched several pogroms aimed at wiping out anyone within Zhentil Keep's sphere of influence who remained loyal to Bane or to Iyachtu Xvim, Bane's half-demon son and a deity in his own right. With the help of Fzoul Chembryl (a former priest of Bane), Iyachtu Xvim opposed Cyric. The struggle between Cyric and Xvim culminated in the near-destruction of Zhentil Keep in 1368 DR, when divine vengeance leveled most of the city and reduced its population from almost sixty thousand to less than twenty thousand. The survivors were left huddled in the city's foreign quarter, while an army of giants and dragons sacked the ruins. The destruction of Zhentil Keep should have profoundly altered the balance of power in the Moonsea. Indeed, Hillsfar and Mulmaster were quick to react. Hillsfar seized the crossroads town of Yülash and pushed on toward Voonlar to cut off the city from the west. Mulmaster dispatched naval patrols that blockaded Zhentil Keep from the east. It seemed as though Zhentil Keep was destined to become yet another Moonsea ruin. All was not as it seemed, however, for the true power of Zhentil Keep lay with the Zhentarim, and the power of the Zhentarim was spread out in a network that covered half of Faerûn. Fzoul Chembryl subverted the High Blade of Mulmaster, winning him as an ally. A carefully. staged naval battle between a major Mulman fleet and the remnants of the Zhent navy resulted in a stunning victory for the Zhents. The Zhent victory eliminated the naval "threat" to Zhentil from Mulmaster while leaving Mulmaster's ships free rein to range the length and breadth of the Moonsea as pirates, to the detriment of Hillsfar and Melvaunt. A careful culling of the Blades of Mulmaster after the naval defeat left the High Blade in undisputed command of the city. Since Selfaril had secretly become a high-ranking member of the Zhentarin, the Zhentarim effectively took control of Mulmaster. Thus, the power of Zhentil Keep grew by leaps and bounds while it seemed a its weakest. A Zhent army under the command of Scyllua Darkhope pushed Hillsfar's troops out of Yülash and relieved pressure on Voonlar. By the end of 1370 DR, Zhentil Keep's rivals found themselves no better off than before. In fact, the secret alliance with Mulmaster gave Zhentil Keep even more power. As of the current day, the other Moonsea cities belatedly suspect the truth. Maalthiir of Hillsfar weighs an accord with distant Sembia, hoping that he can play the merchant power of the Inner Sea against the trading power of the north. Thentia and Melvaunt consider an alliance of defense, neither one anxious to stand alone against the Black Network or a Hillsfar reinforced by Sembian gold. One hardly needs to look far in the Moonsea for some kind of scheme, intrigue, feud, or brewing war. The cities are full of spies, and monstrous raiders threaten the remote settlements. Ghosts of Northteep: Lights are seen underwater in and around the Bell in the Deep. Something is stirring down there. What? Why? Missing Crews: Ships from various ports are found adrift and deserted on the Moonsea, the crews simply gone, leaving the cargo, all their gear and even half-eaten meals behind as if they simply vanished, with no evidence of violence or struggle. Both Zhentarim and independent vessels have disappeared, and all want to know how and why. This open steppe lies between the Dragonspine Mountains, the Border Forest and the Gray Land of Thar. It is the home of proud tribes of mounted barbarians who consider anyone entering their land to be fair game. Although their tribes fight often, they quickly unite against an external threat, such as the Zhentarim march on Glister in Thar in 1352 DR. Mines sponsored by Zhentil Keep and Melvaunt riddle the mountain slopes north of the cold plains. Also known as the Great Gray Land, Thar is a windswept, broken moor with a harsh climate. The local ogres and orcs speak of a time when their people built a great kingdom her; but nothing is left of it now except warring tribes. Legends also speak of Prorbyx's Hammer, a great weapon carried by the first king of Thar, which is presumably hidden somewhere waiting for a new king to wield it. Manticores, giant lizards, bulettes, and flying monstrosities such as yrthaks roam the land. The region is used as a caravan route through the northern Moonsea, with the trademeet site of Glister being the sole human settlement in the area. Strewn with odd pillars and rock formations, the Tortured Land was formed when ancient volcanic lava flows were later carved by flowing ice. These natural sculptures have been smoothed by wind, but some have jagged portions where pieces have broken off. The land is inhabited by small prey animals and fast, ferocious monsters with strange forms.